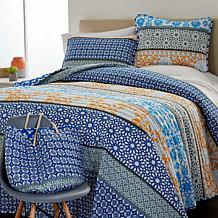 Reinvent your bedroom with the bold patterns in the Oriana quilt set. 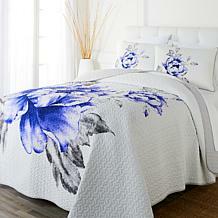 The soft microfiber quilt features classic stripes and trendy chevron with a twist. Navy blue and white create a relaxing mood you'll welcome each evening. This is a great, lightweight quilt. It washes up nicely, and looked very true to the photo. The only minor problem would be that it is not as oversized as it appears in the photo. I purchased a queen for my queen bed and when it's placed on the bed, it only comes down on the sides to just the edge of my mattress, leaving the box spring exposed. I was hoping it would be more like the photo and hang over more. If you want a look like the photo, I'd order a size up. Overall, I still love it.